(AP) Atlantis' six astronauts were supposed to fly to the international space station more than three years ago. But the Columbia disaster in early 2003 and problems with the shuttle fuel tank kept the spacecraft fleet grounded. Through it all, the six astronauts have stuck together, and their 4 1/2 years of training has set a record. Now they're looking forward to an Aug. 27 liftoff. "After Columbia, I wondered if the shuttle was going to fly...I was concerned that we might not get to do this," said Chris Ferguson, Atlantis' pilot, who will make his first trip to space. The long training period together has created a tight-knit group, said Brent Jett, Atlantis' commander. "You're with a group for an extended period of time, you've become really like family," Jett said. "Just like any family, we have our own inside jokes." Of the Atlantic six, two rookies making their first flight in space; three astronauts will make their first-ever spacewalks. Five of the six astronauts are parents, and among them they have 11 children. Not all of the astronauts are American: Mission specialist Steve MacLean is from the Canadian Space Agency and will be the first Canadian to operate the space station's Canadian-built robotic arm. Jett will be making his fourth space trip and he already has experience doing some of the tasks required on this mission: delivering an addition to the space station and deploying solar wings to help power the space lab. Along with Atlantis mission specialist Joe Tanner, he was part of a 2000 mission that performed very similar work. He was selected to join the astronaut corps in 1992. His first spaceflight was a nine-day trip to retrieve a Japanese satellite in 1996. He also visited Russia's Mir space station in 1997, and that was followed by the 2000 construction mission at the space station. Jett graduated first in his class from the U.S. Naval Academy in 1981 with a degree in aerospace engineering and later earned a master's in aeronautical engineering from the U.S. Naval Postgraduate School. During nine years as a naval aviator, he attended the Naval Fighter Weapons School, graduated from the U.S. Naval Test Pilot School and has served overseas, including aboard the USS Saratoga in the Indian Ocean. He expects his greatest thrill on this mission will be seeing the reactions of rookie crew mates, Chris Ferguson and Heide Piper. "I'll be excited just to see them get into space and see their faces on Flight Day 1," Jett said. As a drummer for Max Q, an astronaut garage band, Ferguson wanted to bring his drum sticks with him for his first trip to space. Astronauts can bring a few personal items with them on the shuttle, and Ferguson was down to the last item allowed: "I said I wanted to bring a pair of drum sticks. They said, 'I'm sorry. A pair is two things.'" Along with mission specialist Dan Burbank, Ferguson will use the shuttle's robotic arm to lift the 35,000-pound addition to the space station. He also will be at the controls when Atlantis undocks for a return trip home. Ferguson earned a mechanical engineering degree at Drexel University in 1984 and later got a master's in aeronautical engineering from the Naval Postgraduate School. He spent almost 14 years as a Navy pilot and instructor before he was selected to join the astronaut corps in 1998. He is happy to be part of a mission that is putting the space station back on the path to completion. "The shuttle is back doing what it's designed to do and that is to deliver heavy payloads to space," he said. One of Tanner's Atlantis crew mates has described him as the "king" of spacewalks. Although he doesn't hold the NASA record — that title belongs to astronaut Jerry Ross with nine — by the time Tanner is done with this mission, he will have seven spacewalks under his belt. Tanner joined the Navy shortly after graduating from the University of Illinois with a degree in mechanical engineering in 1973. He earned his pilot wings two years later and joined NASA as an aerospace engineer and research pilot in 1984, teaching astronaut pilots landing techniques. He was selected to be an astronaut in 1992. His first mission was a trip filled with science experiments aboard Atlantis in 1994. He walked in space twice to fix the Hubble Space Telescope in 1997. Along with Jett, he was part of the Endeavour crew that delivered a major piece of the international space station and deployed the first solar arrays to power the space lab. He performed three spacewalks during that mission. "Having done some of these things really helps me," Tanner said. "There's a level of comfort that wouldn't be there if I hadn't done this task before." Burbank was climbing down a ladder from a shuttle simulator last year when he slipped and tore a bicep tendon while trying to support his weight on his arm. Luckily for him, his trip to space was delayed. So he had plenty of time to recover from what could have been a mission-ending injury. Burbank earned a degree in electrical engineering from the U.S. Coast Guard Academy in 1985 and a master's degree in aeronautical science from Embry-Riddle Aeronautical University in 1990. He received his Coast Guard commission in 1985, became a pilot three years later and held various assignments with the Coast Guard until he was selected to be an astronaut in 1996. He was a mission specialist aboard Atlantis in 2000 for a flight that prepared the space station for its first full-time inhabitants. He will perform his first spacewalk during the upcoming mission. "As we go out for the spacewalk for the first time, I think there will be a little bit of butterflies," Burbank said. "The first thing I'm going to do is go slow and ease my way into it." Piper, who will make two spacewalking trips outside of the space station, is joining an elite club of only six other U.S. women and a single Russian woman who have made spacewalks. A big reason so few female astronauts perform spacewalks is because the spacesuit requires a certain stature, said Piper, who is 5-feet-10. "Height is a big part of it," she said. "If you fit in a suit, then the easier it is to work and that's sometimes a make or break on who gets assigned." Piper graduated with a bachelor's degree and a master's degree in mechanical engineering from MIT. She received her commission from MIT's Navy ROTC program in 1985 and became a diving and salvage officer. 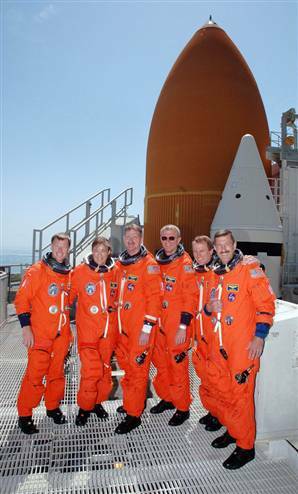 She became an astronaut in 1996 and has waited a decade for her first trip to space. Piper thinks her background as a Navy diver has helped her train for her two spacewalks. "I have a good idea in my mind how difficult it is to do things when you're not standing on the ground ... how you have to think differently when you're kind of floating," she said. Thirty years ago MacLean was on the Canadian National Gymnastics team trying to make the Olympics, an experience that served him well as an astronaut about to perform his first spacewalk. "It's similar in the sense of the discipline that's required, the attention to details that's required to be an athlete or a spacewalking astronaut," he said. MacLean earned a bachelor's degree and a doctorate in physics from York University in Toronto. He was a visiting scholar at Stanford University, studying laser physics under the Nobel laureate A.L. Schawlow. He was picked as one of the first six Canadian astronauts in 1983 and flew on his first shuttle mission aboard Columbia in 1992. He was chief science adviser for the international space station and director general of the Canadian Astronaut Program in the mid-1990s. He will become the first Canadian to operate the space station's Canadian-built robotic arm and be only the second Canadian to go on a spacewalk. "I feel privileged at operating the robotic arm," he said. "I was around all those guys who helped work on it."